The moment she stepped off the elevator, she was met by co-worker after co-worker who needed and wanted to talk to her — one about a health concern, another about his kid excelling at school, another about a disintegrating marriage. She comforted, celebrated with, and listened to each one in turn. She didn’t, however, price the product. This is just one piece of advice Scott discovered during the last 20 years, and has carried with her through leadership roles at some of the biggest and influential tech companies in the world. Most recently, she advised Dropbox and Twitter. At First Round’s recent CEO Summit, she shared what she believes to be the most important management lessons she’s learned. The morning she got distracted from the pricing decision was not an exception. Finding the time to focus on “the work” without being interrupted was a constant struggle. She even called her CEO coach at the time and asked, “Is my job to build a great product or am I really just an armchair psychiatrist?” She got her answer when her coach literally yelled at her: “It’s called management and it is your job!” “These words have always rung in my ears, every time I’ve been tempted to stop caring,” Scott says. Management is a deeply, deeply personal thing. Good management is about deep personal relationships, which can be hard to accept when you’re all about growing fast. As Scott says, the hardest lesson about giving a damn — about management — may be that it doesn’t scale. And that’s okay. Their past. What changes have they made over time? Take their history as they tell it to you and pull out their core values, what motivates them, what do they really care about? Write down three to five learnings and then verify them with the person: “So what I’m hearing you say is that you care about freedom — freedom of time, not the freedom that money buys. Am I right?” Make sure you understand them, Scott advises. Their future. “Ask them: What are the three to five things they really want to be? Nobody knows the one thing they want to be — but they’ll probably have three to five conflicting images of what they really want to do in life.” Get those on the table, and encourage the person to be honest. Have fun talking about it. Scott breaks giving feedback into four quadrants. 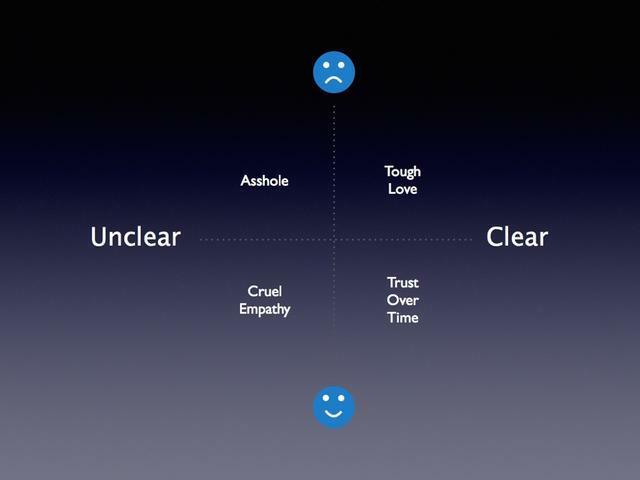 On the horizontal axis you have unclear to clear feedback, and on the vertical you have the spectrum of anticipated emotions from happy to unhappy. The gentler the feedback, the less clear it tends to be. That’s the cruel empathy quadrant. The one you want to be in is the top right — clear even if it’s bad news. Tough love is how you build trust the fastest. Reserve a special one-on-one every quarter with each of your reports. Warn them that this is the meeting where they give you feedback. Then make it easy for them to start the conversation. Ask them: “What can I start doing? What should I stop doing? What should I keep doing?” Whatever it is, come up with a formula that makes it easier to get the ball rolling at the start. So, first you have to listen. Then you have to communicate. "But don’t spend too much time communicating because if you’re a great communicator, people will start to tell you where they disagree, and it’s time to start listening all over again..."
Consider using your staff meeting to set the agenda for the big decision meeting. Identify the three most important decisions that need to get made that week, and who should make those decisions. Who is closest to the work involved? “This is how you push decision-making into the facts,” she says. Block off a whole hour for each report every week. You don’t have to fill the time, but they should know it’s there if they need or want to. Try to have the meeting over a meal, or in a more casual setting. “This is why it’s important to limit reports to five to seven per manager. This type of time and attention doesn’t scale,” Scott says. If you're going to be a great manager, you can't have too many reports. In the book The Fountainhead, there are two characters: The architect who is destined to change the face of the city, and his best friend, the electrician — the unsung hero who brings the city to life. To Scott, they are representative of the two major types of high-performing employees: People on a steep growth trajectory, and people on a more gradual growth trajectory. “At too many companies, people on a gradual growth trajectory are treated as second-class citizens. This is a mistake,” she says. 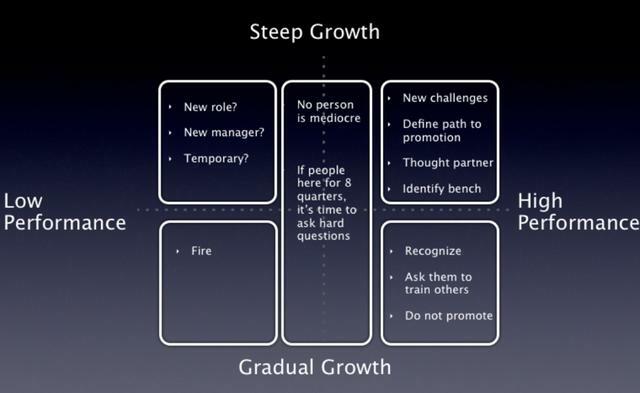 People on a steep growth trajectory need to be managed in a very particular way. “You need to make sure you’re pushing them to take on new challenges. Make sure you are defining their path to promotion. Make them your thought partner. Don’t ignore them because they are independent. Don’t ignore them in the spirit of not wanting to micromanage them.” At the same time, these employees can be high-maintenance. They are unlikely to stay in one place for long. Give excellent ratings to everyone who is performing exceptionally. Even at some of the best companies, people who have valuable skills but who aren’t likely to “take over the world,” will often be rated as meeting expectations because managers reserve high ratings for people they're going to promote. This creates an unhealthy promotion-obsessed culture. Don’t ignore the middle. Very few people are truly mediocre. “If someone has been somewhere more than two years and has just met expectations the whole time, it’s time to ask yourself the hard question: If they weren’t there could you hire somebody more likely to excel? Evaluate skilled underperformers. If somebody is not doing well in their role but is talented, it’s time to look at yourself in the mirror: Have you put this person in the wrong role? Is your management style just a bad fit for the person? Is this person experiencing a temporary personal problem? Require all of your managers to take 15 minutes to slot their reports into one of the five boxes in the matrix above. Have them literally write the names in the quadrants, and have them do this once a year. Urge them to take action on the results. “Make sure you’re doing right by every person in every quadrant,” Scott says.